This list is compiled by stats and what makes it interesting is that it has a variety of puzzles and games. There is something for everyone included in this list. We have a physics game, spatial awareness puzzle, room escape, 3D maze, and even some trivia. This shows the diversity of Samgine’s audience and their willingness to try new puzzles. It is hard to predict what makes a flash based game or puzzle popular. But, when one gets popular, there is usually some element of game-play that separates them from the rest. You certainly can see uniqueness in each of the following examples. So without further ado, here is the top five games of last year (2009). Puzzles involving physics are very popular on our site as well as around the internet. Super Stacker uses the simplicity of balancing shapes (with emotional faces) to make this a total crowd pleaser. The New Switcheroo is over a year old. The object is simple, turn all of the buttons white, while each button has a white and yellow state. Executing this task is difficult, because each button affects its neighbors’ color differently and as the game progresses, the difficulty increases by introducing new button symbols. Room escape games can feel, fake. Graphics are illustrated or computer animated. Puzzles are centered around out-of-this-world devices and objects. In steps Boxed Inn: Panic Room, a Samgine developed game, to change that notion. Boxed Inn’s graphics are photo-realistic and the puzzles play on real-world mediums and technologies such as a TV or Laptop. While you may never find yourself trapped in a panic room, JayIsGames.com reviewed this as ‘Lengthy, clever and involved’. 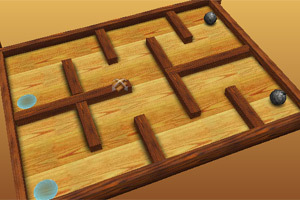 Title is a 3D maze that is based off the labyrinth wooden maze, a mechanical puzzle where the puzzler rolls a marble through a maze of walls, gaps and game-ending holes. The difficulty lies within only being able to use knobs which tilt the x and y axis of the surface to steer the marble. Tilt, the flash version of this mechanical puzzle recreates all these elements well. The best part is that there is more than one level, which allow difficulty to increase at a steady pace. It also explores new obstacles such as having to steer multiple marbles simultaneously or shift loose shapes that block passages.